I gave the key note address at the 2014"Cripping" the Comic Con at Syracuse University today. I throughly enjoyed. My talk was well received. Discussing the Walking Dead television program and assisted suicide was not easy. I had to gear my talk to these that know the how in passing as well as those that are obsessed with the show. I truly enjoyed as I was well outside my comfort zoom of typical academic audiences and delivery of my ideas. I got to poke fun of a host of bioethicists and even show a photograph of Jeremy Bentham. A win win situation. And yes that is me made up like a zombie. 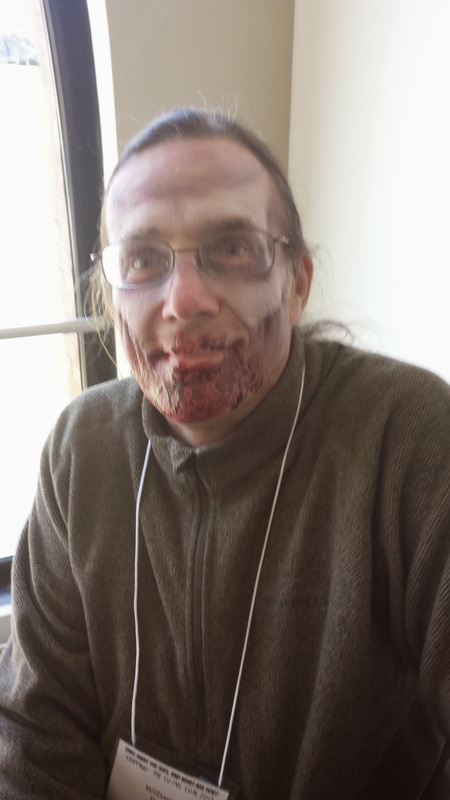 The best part of the day was the zombie walk from the Syracuse student center to the quad. I led the way with Diane Wiener who organized the event. A large contingent of people made their way to the quad most of whom were dressed up as zombies. Moans and groans emanated from one and all. People were staring at us for good reason. It is not every day you see a bunch of crippled people, actors, performers, presenters and the university photographer dancing around. There were era formal events being held on the quad. Most professional zombies were young men and women who were lets say wee rambunctious. So much fun to see some of these young men terrorize students. My favorites were a slender young woman who accosted some men playing soccer. She stole their ball and threatened to bite them! Another favorite as a tall large man in surgical garb. Really off beat day. Not a typical conference thats of sure. I can honestly say I let my freak fly today.